1902 James B Lansing born in Illinois. 1934 Douglas Shearer of MGM heads team which designs first practical loudspeaker system for motion picture use. Lansing builds components for the system. 1937 Shearer system awarded citation by the Academy of Motion Picture Arts and sciences. 1941 Lansing Manufacturing Company acquired by Altec Service Company. 1943 Lansing develops improved manufacturing methods, including flat wire milling and high-speed winding of ribbon wire voice coils. 1943 Lansing designs the 604 Duplex loudspeaker. 1944 Lansing and Hilliard redefine the state of the art for the motion picture theater with the A-4, dubbed Voice of the Theatre. 1946 Lansing founds a new company, James B. Lansing Sound, Incorporated, to pursue new directions in transducer and sound system design. 1947 JBL introduces the D-130 15″ loudspeaker, which was the first known use of a 4″ flat wire voice coil in a cone transducer. 1949 James. B. Lansing dies; William Thomas becomes company president. 1954 JBL introduces the model 375 high-frequency compression driver. 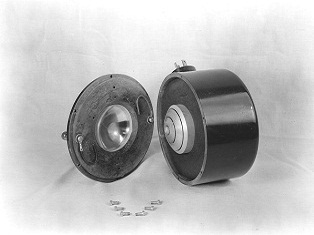 This was the first commercially available 4″ diaphragm driver and afforded flat response to 9 kHz. 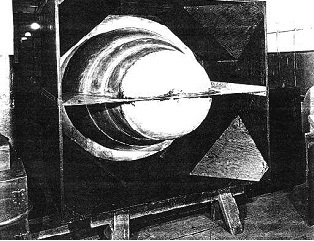 1954 JBL introduces a family of acoustic lenses, developed by Locanthi. 1954 Model 075 high-efficiency, high-frequency ring radiator introduced. 1955 Leo Fender of musical instrument fame incorporates the model D-130 into his famous guitar amplifiers, signaling JBL’s entry into the music reinforcement field. 1958 JBL introduces the Paragon stereophonic loudspeaker system, incorporating a cylindrical reflecting principle for superior stereophonic imaging in the home. 1962 JBL introduces the first two-way studio monitor using a high-frequency compression driver with acoustical lens. 1965 JBL introduces the-“T-circuit” output configuration for high performance solid state amplifiers. 1968 JBL introduces the 4310-three-way bookshelf monitor. This system lives on through the models 4311 and 4312. 1969 Sidney Harman acquires JBL from William Thomas. The company embarks on a period of accelerated international growth through the Harman distribution companies. 1969 The L-100, a consumer version of the 4311, is introduced, eventually reaching sales of 125,000 pairs during the decade of the seventies. 1969 JBL transducers power Woodstock and other major rock festivals. 1973 JBL introduces the expanded line of 4300-series monitors, including the industry’s first four-way designs. 1975 JBL introduces Model 4682 “Strongbox” Line Array. 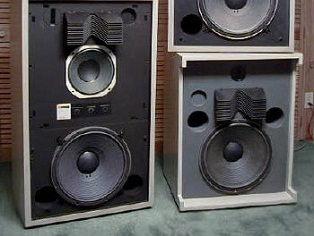 1976 JBL’s monitors rank first in the US recording industry survey conducted by Billboard. 1977 JBL moves to new location in Northridge, California. 1979 JBL introduces patented diamond surround diaphragm technology for high frequency resonence control. 1979 JBL developes SFG Symetrical Field Geometry magnet structures. 1980 JBL introduces patented Bi-Radial© Constant-Coverage horn technology. 1981 Bi-Radial monitors introduced. Building on the acoustical concept of flat power response, the 4400-series monitors quickly gain acceptance by the recording industry. 1981 L250 four-way consumer system introduced. 1982 Titanium is introduced as a diaphragm material in compression drivers. 1983 The model 4660 defined coverage system. Based on Bi-Radial technology, the system provides tailored coverage for speech application in rectangular spaces. 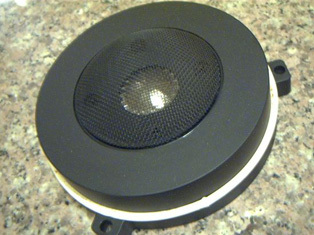 1984 Titanium dome tweeters are introduced into consumer products, providing superlative response to 27 kHz. 1984 UREI acquired by JBL, bringing electronics design and manufacturing expertise to JBL’s traditional line of loudspeaker components. 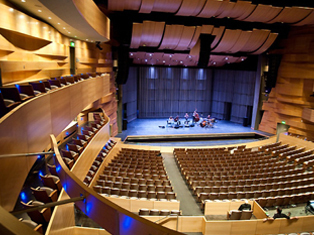 1984 The Academy of Motion Picture Arts and Sciences selects JBL components for the new system in the Samuel Goldwyn Theater. 1985 The Everest DD 55000 system is selected by Japan’s Stereo Sound as Product of the Year. 1986 JBL introduces the first Control® Series multi-purpose molded enclosure loudspeakers. 1988 JBL acquires the British Soundcraft line of recording consoles for recording and reinforcement applications. 1989 The Directors’ Guild of America selects JBL components for the systems in their Hollywood headquarters building. 1990 JBL develops patented VGC (Vented Gap Cooling) for raising the thermal power limits of low frequency transducers. 1991 JBL’s K-2 loudspeaker system is selected by Japan’s Stereo Sound as Product of the Year. 1991 JBL introduces first Pro Audio Neodymium woofer debuting in JBL Array Series. 1992 JBL introduces new lower midrange compression driver with matching horns. 1993 JBL develops new “rapid flare” low distortion compression driver and matching family of horns. 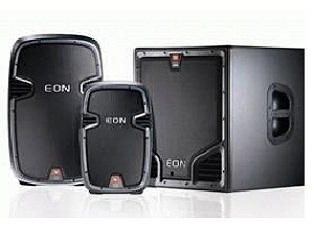 1995 JBL introduces the revolutionary EON System powered loudspeaker, with multiple patented design technologies. 1995 First-ever patented dual coil Differential Drive® Loudspeaker for pro sound reinforcement. 1996 HLA Series with patented Space Frame® array element design, multi-band waveguide and composite subwoofer enclosure introduced. 1999 JBL is the official “Sound of Woodstock”. First in 1969, then in 1994 and again in 1999. 2000 JBL announces VERTEC™ Line Array System, which debuts at the Democratic National Convention. 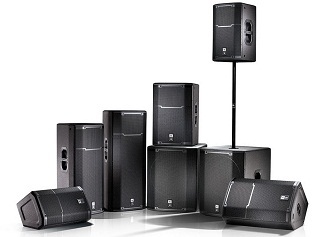 2000 JBL introduces the EVO® intelligent loudspeaker system with DSP self-control. 2001 JBL VERTEC system used for Presidential Inauguration, Washington, D.C., for a crowd of 300,000 persons. 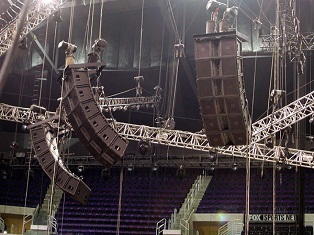 2002 JBL VERTEC system used for major special events including the Superbowl, the Grammy Awards and the World Cup Opening Ceremony (Seoul, Korea). 2002 JBL’s John Eargle, Mark Engebretsen and Don Keele receive a Scientific/Technical Award from the Academy of Motion Picture Arts and Science honoring their development of cinema loudspeaker systems using constant-directivity horns and vented-box low frequency enclosures, first embodied in the JBL 4675. 2002 JBL’s Bernard Werner and William Gelow receive a Technical Achievement Award for “the engineering and design of filtered line arrays and screen spreading compensation as applied to motion picture speaker systems” as employed in JBL ScreenArray © cinema loudspeaker.